Robert Bob Edwards is an American broadcast journalist, a Peabody Award-winning member of the National Radio Hall of Fame. He gained reputation as the first host of National Public Radio’s flagship program, Morning Edition. 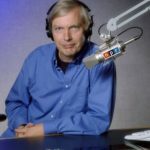 Starting in 2004, Edwards then was the host of The Bob Edwards Show on Sirius XM Radio and Bob Edwards Weekend distributed by Public Radio International to more than 150 public radio stations. Those programs ended in September 2015. "I go home by noon, and I’m in bed by 6 p.m. I get up at 1 and do it again."